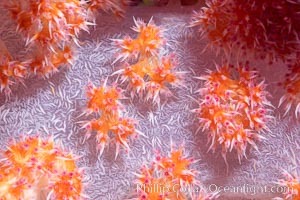 Dendronephthya soft coral detail including polyps and calcium carbonate spicules, Fiji Namena Marine Reserve Photo. Crinoid (feather star) extends its tentacles into ocean currents, on pristine south pacific coral reef, Fiji Namena Marine Reserve Picture. 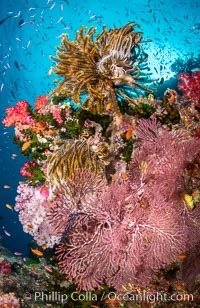 Beautiful South Pacific coral reef, with Plexauridae sea fans, schooling anthias fish and colorful dendronephthya soft corals, Fiji Stock Photography of Namena Marine Reserve. 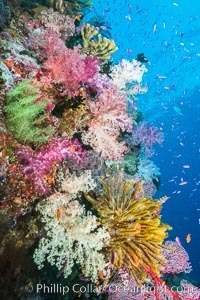 Brilliantlly colorful coral reef, with swarms of anthias fishes and soft corals, Fiji Photograph of Namena Marine Reserve. Closeup view of colorful dendronephthya soft corals, reaching out into strong ocean currents to capture passing planktonic food, Fiji. Namena Marine Reserve Photos. 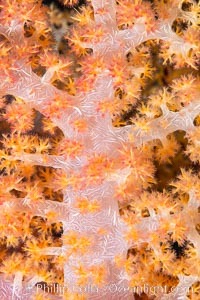 Dendronephthya soft coral detail including polyps and calcium carbonate spicules, Fiji Namena Marine Reserve Image. Sarcophyton leather coral polyp detail, close up view, Fiji. 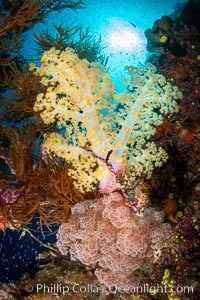 Professional stock photos of Namena Marine Reserve. Dendronephthya soft coral detail including polyps and calcium carbonate spicules, Fiji Pictures of Namena Marine Reserve. 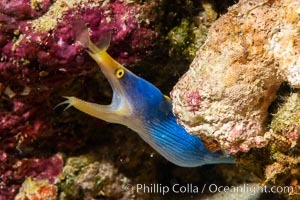 Blue ribbon eel, Rhinomuraena quaesita, leafnose moray eel, Fiji Namena Marine Reserve Photo. 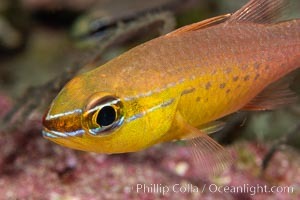 Cardinalfish, Fiji Namena Marine Reserve Picture. 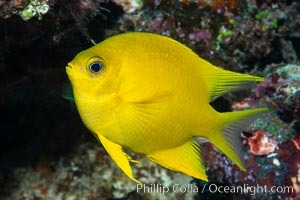 Golden Damselfish, Fiji Stock Photography of Namena Marine Reserve. 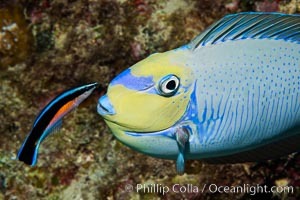 Bignose Unicornfish, Naso vlamingii, being cleaned by a small wrasse, Fiji Photograph of Namena Marine Reserve. 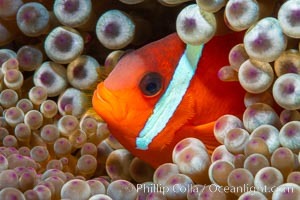 Fiji Barberi Clownfish, Amphiprion barberi, hiding among anemone tentacles, Fiji Namena Marine Reserve Photos. 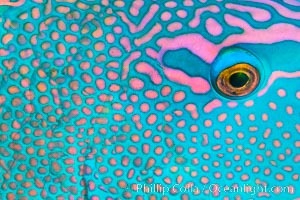 Parrotfish detail, Fiji Namena Marine Reserve Image. 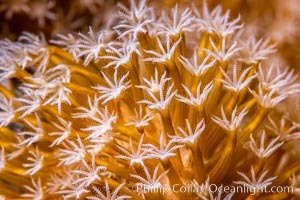 Dendronephthya soft coral detail including polyps and calcium carbonate spicules, Fiji Professional stock photos of Namena Marine Reserve. 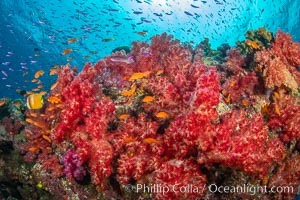 Spectacular pristine tropical reef, including dendronephthya soft corals, sarcophyton leather corals and schooling Anthias fishes, pulsing with life in a strong current over a pristine coral reef. 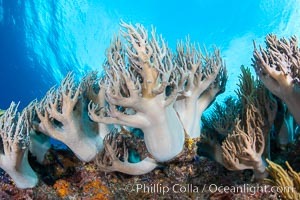 Fiji is known as the soft coral capitlal of the world. 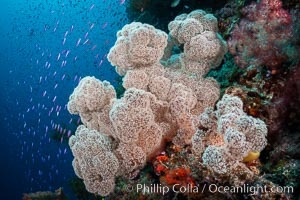 Pictures of Namena Marine Reserve. Dendronephthya soft corals and schooling Anthias fishes, feeding on plankton in strong ocean currents over a pristine coral reef. 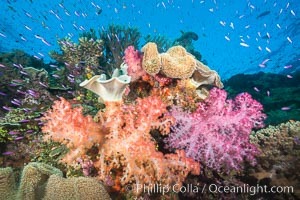 Fiji is known as the soft coral capitlal of the world. Namena Marine Reserve Photo. 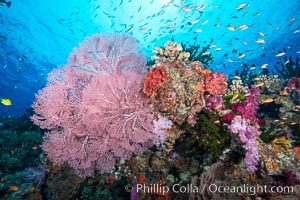 Spectacular pristine tropical reef with vibrant colorful soft corals. 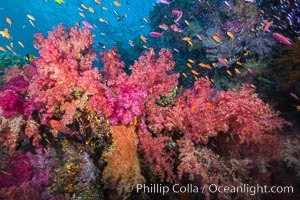 Dendronephthya soft corals, crinoids, sea fan gorgonians and schooling Anthias fishes, pulsing with life in a strong current over a pristine coral reef. 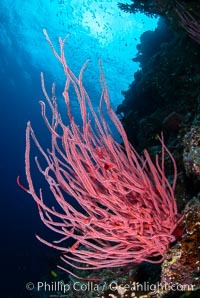 Fiji is known as the soft coral capitlal of the world. Namena Marine Reserve Picture. 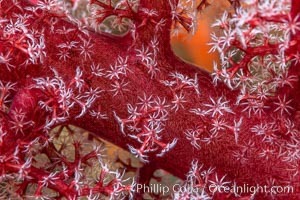 Red whip coral, Ellisella ceratophyta, Fiji Photograph of Namena Marine Reserve. 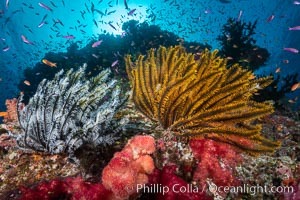 Beautiful South Pacific coral reef, with Plexauridae sea fans, schooling anthias fish and colorful dendronephthya soft corals, Fiji Namena Marine Reserve Photos. Aerial View of Namena Marine Reserve and Coral Reefs, Namena Island, Fiji Namena Marine Reserve Image. Spectacularly colorful dendronephthya soft corals on South Pacific reef, reaching out into strong ocean currents to capture passing planktonic food, Fiji. 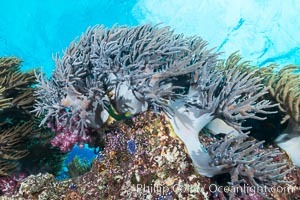 Professional stock photos of Namena Marine Reserve. 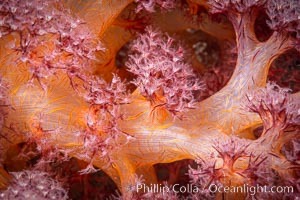 Sinularia flexibilis finger leather soft coral, Fiji Pictures of Namena Marine Reserve. 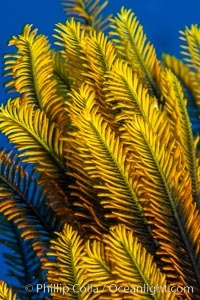 Crinoid feather star closeup view of tentacles, which it extends into ocean currents, Fiji. Namena Marine Reserve Photo. 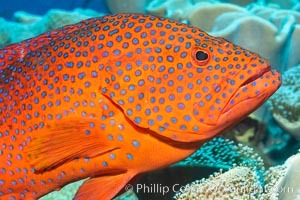 Coral Hind, Cephalopholis miniata, also known as Coral Trout and Coral Grouper, Fiji Namena Marine Reserve Picture. 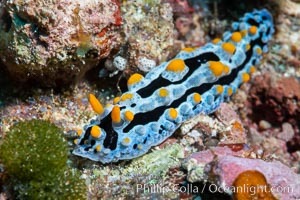 Phyllidia coelestis nudibranch, Fiji Stock Photography of Namena Marine Reserve. 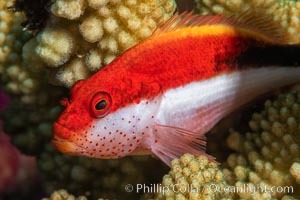 Blackside hawkfish on hard coral, Paracirrhites forsteri, close-up, Fiji Photograph of Namena Marine Reserve. Sinularia flexibilis finger leather soft coral, Fiji Namena Marine Reserve Photos. 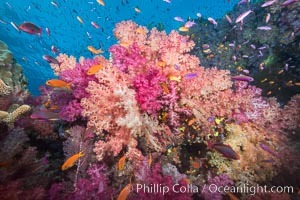 Dendronephthya soft corals and schooling Anthias fishes, feeding on plankton in strong ocean currents over a pristine coral reef. 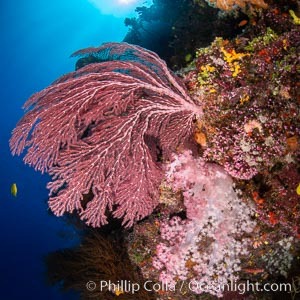 Fiji is known as the soft coral capitlal of the world. Namena Marine Reserve Image.